Get the highest video performance with Class 10 rating for full HD video (1080p), plus more speed to catch the shot with your point and shoot camera. 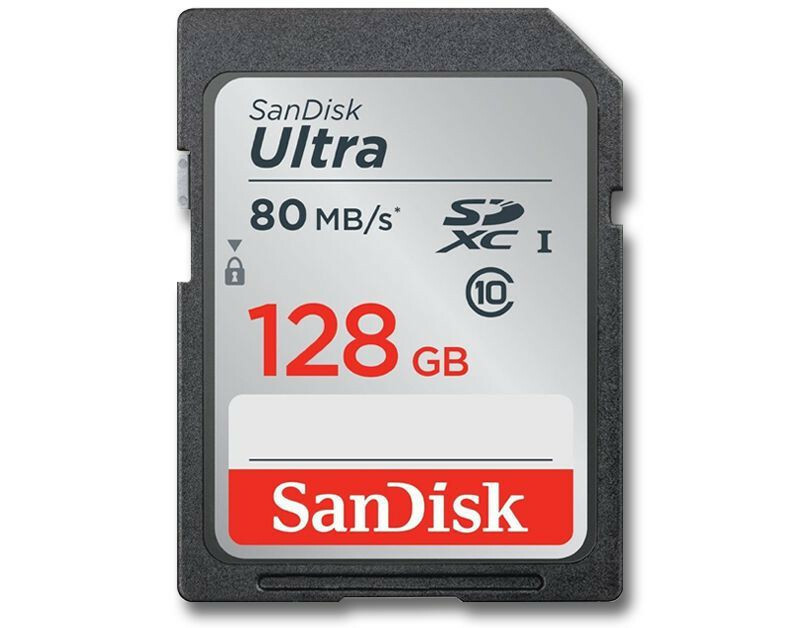 With SanDisk Ultra® UHS-I cards you'll benefit from faster downloads, higher capacity, and better performance to capture and store more Full HD video. Take advantage of ultra-fast read speeds of up to 80 MB/s to save time when moving images from the card to your computer. 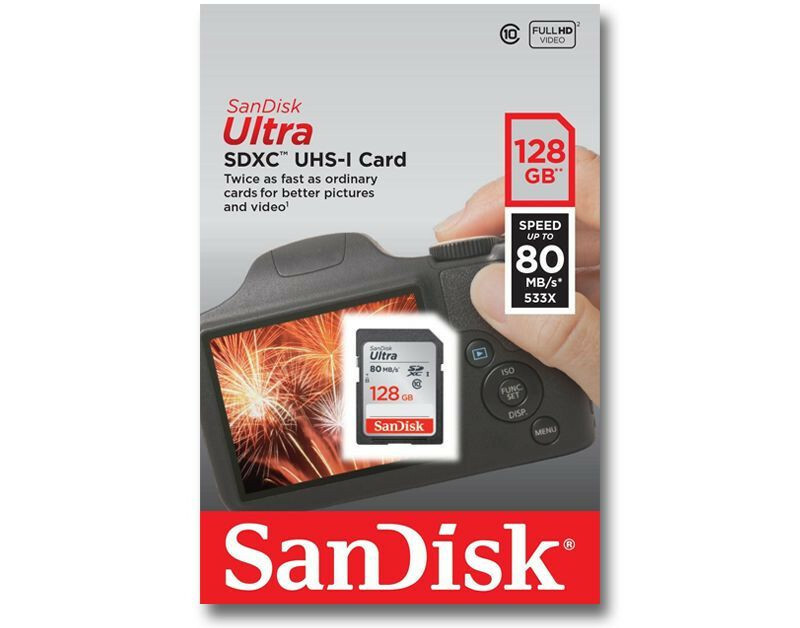 SanDisk Ultra memory cards are water-proof, temperature proof, X-ray proof, shock proof, compatible with all SD/SDHC digital devices, and come with world-class customer support. * Up to 80MB/sec read and write speed. Based on SanDisk internal testing; performance may vary depending upon host device. 1 megabyte (MB) = 1 million bytes. IMPORTANT - Please check that your device is compatible with this product. Only unopened memory cards can be returned if they are not compatible. You will require a memory card reader capable of reading SDXC memory cards to access footage/images on this card otherwise you can use your camera's data transfer cable to view images on your PC/Mac. Q. If I order this memory card now, when will it be dispatched? A. If you place your order before 4pm on a week day, we will despatch your order the same-day. If you order after 4pm on a Friday, on Saturday or on Sunday, your order will be despatched the following Monday morning. Q. My manual states that I need an 'SD Card', can I use SDHC as well? A. Unfortunately not. SDHC is a higher capacity version of SD cards and can only be used where indicated. Q. How do I know if this card is compatible with my camera / camcorder? A. We do have a compatibility list that you can check but the best thing to do is check with your camera manual to be 100% sure. Q. Can I return the card if it is not compatible with my camera / camcorder? A. Yes but only if it remains unopened and in a re-saleable condition. We understand that this makes it difficult for you to check if it is compatible but we can only strongly advise that you check your manual. We hope you understand and apologise for an inconvenience caused. Q. Are you cards 'Class 1' or 'Class 2' cards? A. Our cards and the majority on the entire market now will all be Class 2 type cards. Q. Why are cards with the same capacity so different in price? A. It may seem strange that we have the same capacity cards with very different prices. This comes down to 2 reasons. The main reason is the speed of the card is likely to be different and you will pay more for a faster card with faster write speeds. The second reason, if the cards are the same capacity and the same speed, the price difference will down t nothing other than our in-cost which can vary depending on the cards manufacturer.